The earliest biographical dictionaries to deal with the life of Abū l-Qāsim al-Qushayrī (d. 465/1072) typically mention the composition of a major Qur’an commentary (al-Tafsīr al-kabīr) before 410/1019-20. Many scholars have mistakenly identified this work as the Laṭāʾif al-ishārāt. This, however, is impossible since the Laṭāʾif al-ishārāt was begun later in al-Qushayrī’s life, namely in 437/1045-6, a date attested by the text itself. A complete manuscript of al-Tafsīr al-kabīr does not appear to survive. Nevertheless, two very different manuscripts (MS Leiden Or. 811 and MS Laleli 198) have been found that various scholars have claimed to be remnants of al-Tafsīr al-kabīr. While each on their own might be judged to be a remnant of this early commentary, they appear to be two very different texts when read side-by-side. This poses a dilemma for ascertaining authenticity. During the course of my study of the Laṭāʾif al-ishārāt I briefly tackled this issue and provided only a cursory examination in Sufi Master and Qur’an Scholar. I have since been able to conduct a more thorough comparative analysis of these two manuscripts and have presented my findings in an article published in the peer-reviewed Journal of Sufi Studies from Brill. The article appears in a special issue of the Journal of Sufi Studies dedicated to al-Qushayrī and his legacy. A panel of papers on al-Qushayrī was initially conceived by Prof. Matthew Ingalls at the University of Puget Sound for the American Academy of Religion. Together we co-organized such a panel that convened on 31 October 2010 in Atlanta, Georgia. After an engaging session, I worked to get our papers published collectively. 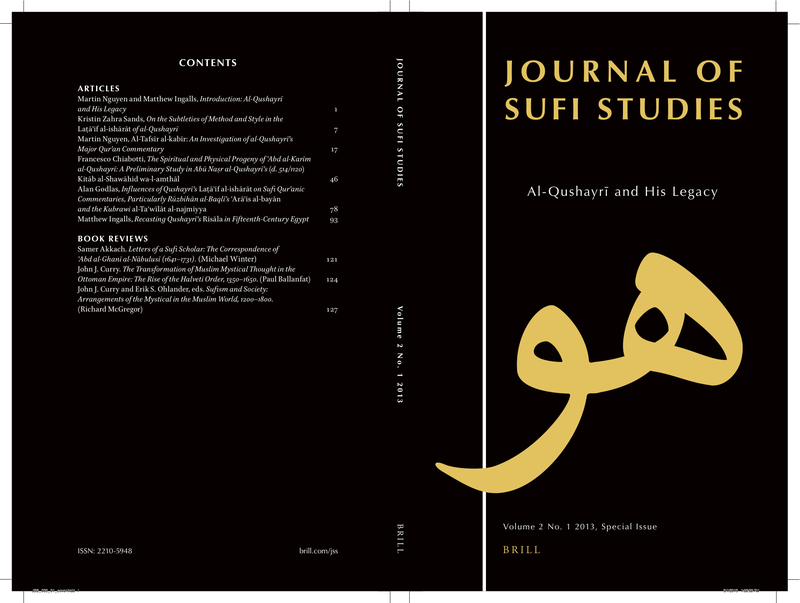 Thanks to Erik Ohlander, the Executive Editor of the Journal of Sufi Studies, we were able to put together a special issue appropriately titled “Al-Qushayrī and His Legacy” that appeared in March of 2013. An introductory essay for this issue was co-authored by Ingalls and myself. Named after the special issue, “Introduction: al-Qushayrī and His Legacy,” that essay is available here. My article investigating MS Leiden Or. 811 and MS Laleli 198, entitled “Al-Tafsīr al-kabīr: An Investigation of al-Qushayrī’s Major Qur’an Commentary” is available here. Please see the JSS website for the other articles published in this issue.